Former President Boris Yeltsin’s passion for killing moose (boar, duck, hare, bear, deer) to feed his appetite for their small body parts, cooked or pickled, has been repeatedly attested in the memoirs of his staff . 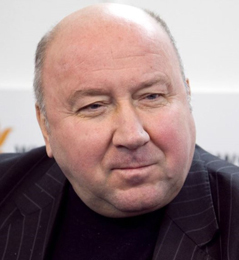 But the state-financed Boris Yeltsin Presidential Centre, run by deputy executive director Vladimir Shevchenko, Yeltsin’s former chief of protocol, refuses to say that he ate moose lips even once. “What are your goals in asking these questions?” Shevchenko telephoned to say, after the Centre had been requested to confirm that moose lips had been on the menu of a luncheon Yeltsin hosted for US President Bill Clinton January 13, 1994. Clinton referred to the dish of moose lips, and also pig’s ears, in a telephone conversation he had with UK Prime Minister Tony Blair in a record declassified and released publicly earlier this month. Shevchenko said he is concerned by the moose lips question because of the presidential election campaign now under way in the US. Perhaps it can affect [Hillary] Clinton, he mused aloud. He wanted to know whether the question was being asked to strike at Clinton’s campaign. “Are you a Republican or a Democrat?” Shevchenko asked – without divulging whether moose lips had been served 22 years ago last Tuesday. The full story of Clinton’s secret conversations with Blair about Yeltsin was published yesterday. 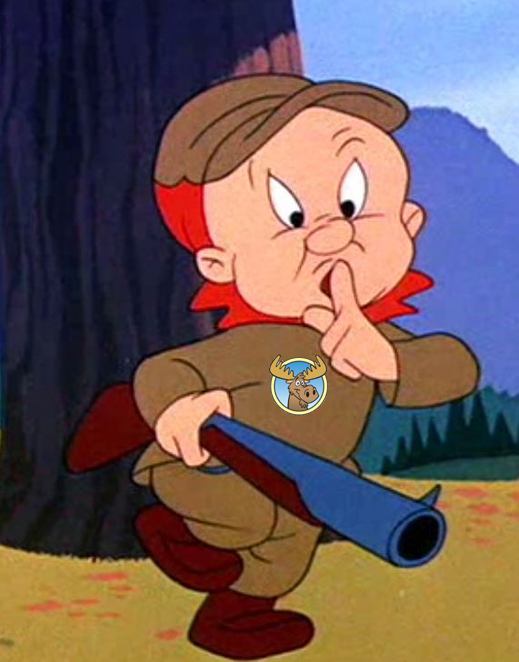 After the Yeltsin Centre refused requests to confirm the moose lips reference, and Shevchenko replied with his Clinton campaign question, he was asked to say what the presidential centre records show of how many moose Yeltsin had shot, and whether he had done so with the same hunting arrangements as characterized the famous hunter of the Soviet epoch, Leonid Ilyich Brezhnev. Moose lips may have been Bill Clinton’s secret with Tony Blair until this month. But Hillary Clinton reported in her 2003 memoirs that when Yeltsin served moose lips in soup, they “looked like rubber bands that had lost their stretch”. Yeltsin’s fancy for dishes of moose lips has also never been a Russian state secret. Also, on the dining table at Zavidovo, according to Korzhakov, “I remember the cooked rabbit kidneys, the ears of beef, and the favorite dish moose lip. It is necessary to kill the whole moose to prepare this delicacy.” Korzhakov has confirmed Clinton’s account of the January 1994 lunch with moose lips. He also confirms Hillary Clinton’s account of moose lips soup. That was served, Korzhakov says, at a lunch Yeltsin gave the Clintons at the Russian Embassy in Washington in September 1994. Pig’s ears were also served. In 2014 Argumenty i Fakti published memoirs of Kremlin chefs, confirming Yeltsin’s appetite for moose lips, and a picture of him eating at the table of a Yakut reindeer herder in 1990. About Yeltin’s likeness to Brezhnev as a hunter, there are private Soviet intelligence sources, and published Russian memoirs. As his health deteriorated, along with the steadiness of his aim, Brezhnev’s bodyguards used to arrange for gamekeepers to shoot animals, then prop them up within close range of the hide into which Brezhnev was led for the shoot. The props ensured that he never missed his kills, the sources say. 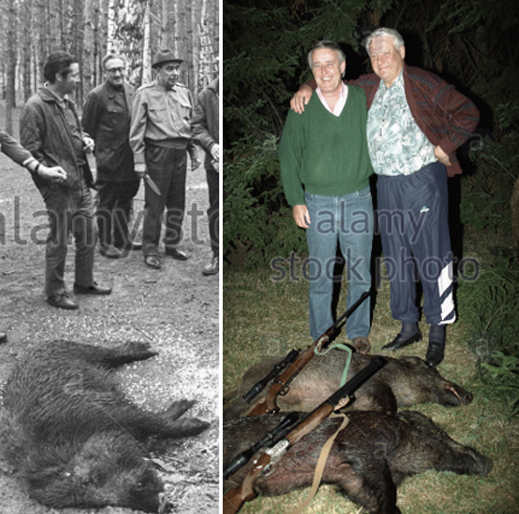 Left, Brezhnev and Kissinger at boar kill, May 1, 1973; right, Yeltsin and Canadian Prime Minister Brian Mulroney, boar kill, May 7, 1993. How much of a marksman Yeltsin was is a secret Shevchenko – turning 77 next month — has sworn to take to his grave. Also secret is how much it cost. State budget money and public taxpayer funds were used to finance Yeltsin’s appetite for hunting. His Zavidovo retreat in Tver region, for example, was legislated to become a national park, expanded in area, and stocked with game animals. But only one person was allowed to use the national park – that was Yeltsin with his retinue, and his guests. 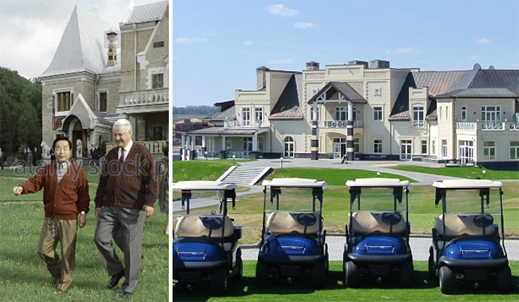 Since 2012 Yeltsin’s preserve has sub-divided into a golf club; a commercial resort in state concession; an enterprise park for Japanese investors; and a Belgian glass plant. Left: Yeltsin at Zavidovo with South Korean President Kim Young Sam in June 1994. Right: the Zavidovo golf clubhouse in 2013. The cost of renovating the original building and constructing the centre was Rb4.98 billion from the federal budget ($156 million), plus another Rb2 billion ($66 million) as a loan from the Sverdlovsk region. The Kremlin notices for allocations from the budget of Rb2 billion annually in 2009 and 2010 can be found here. Last month, Sverdlovsk region deputies complained that the Yeltsin Centre was delaying repayment of the loan. Plaques installed at the entrance to the centre record individual donations from Gazprom, Roman Abramovich, Vladimir Potanin, and Putin in his private capacity; the amount of the gifts isn’t indicated. In response to Shevchenko’s refusal to answer the moose menu question, he was asked: “Yeltsin is dead, and he, his Centre, and their information services are funded by the taxpayers of Russia. According to the statements made by Madame Yumasheva to President Putin last November, the Yeltsin Centre is an open institution designed to assist in the education and information of the public. Don’t you lack the authority to discriminate [against some questions in favour of others]?” Shevchenko did not reply. 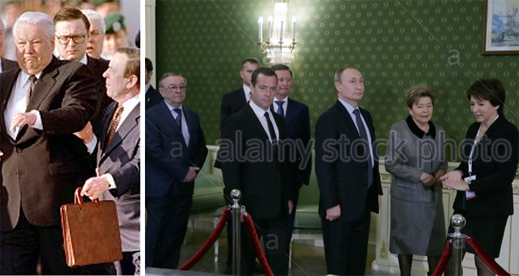 Right: Shevchenko, at far left, escorting Prime Minister Medvedev, Chief of Staff Ivanov, President Putin, Naina Yeltsina, and Tatiana Yumasheva (Yeltsina) at the Yeltsin Centre, November 25, 2015. Shevchenko’s memoirs published in 2004 with the title, The Everyday Life of the Kremlin Under the Presidents, do not mention moose lips.